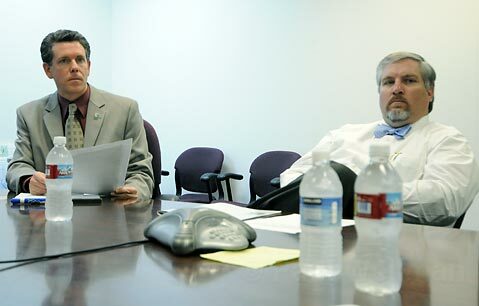 <strong>WHAT'S OURS IS OURS:</strong> Goleta City Manager Dan Singer, left, has argued that the City of Goleta should be receiving property tax revenues that currently are allotted to Goleta West, which receives roughly $1.2 million annually. The question of Goleta West Sanitary District’s future has come bubbling to the surface again. The City of Goleta released a financial report this week that, according to city officials, proves that detaching management of sewage infrastructure within city limits from the Sanitary District’s jurisdiction would be cost-effective. As things stand, Goleta West has dominion over a vast expanse of wastewater resources, including much of the City of Goleta, Isla Vista, and some areas just west of the city. However, through a loophole in state Proposition 13-passed in the late 1970s to protect property owners from increases in property taxes when their holdings went up in value-the nearly 50-year-old district receives property tax revenues amounting to roughly $1.2 million annually. Not long after Goleta was forced to cut more than $1 million from its budget in the face of a faltering economy, Dan Singer, Goleta city manager, said the city should be receiving the property tax revenues currently allotted to Goleta West. The prize jewel in the treasure chest is the district’s nearly $30-million reserve fund, which Mark Nation, Goleta West’s general manager, said has been set aside for a number of capital improvement projects; namely, a $20-million upgrade to the sewage treatment plant. “Nobody’s accused them of not doing a good job of hoarding money,” said Singer, opining that although they’re doing nothing illegal, the district’s use-or lack of use-of property tax revenue goes against state guidelines. “There are lies, damned lies, and statistics. I’d say this report contains all three of those,” said Dr. David Bearman, a director on Goleta West’s board, of the city’s report. The fulcrum of the conflict between the two agencies seems to be a matter of mentality. Goleta West has been saving for a rainy day for some years, and the city feels that the money would be better used if spent on a variety of purposes. While the city agrees that much of the district’s reserves would be best left untouched for use on upcoming capital improvement projects, Singer and Giles intoned that property tax revenue should be spread among fire protection, police services, school districts, community services, and other general fund services affected by the budget crunch.